MINNEAPOLIS (AP) — After a dozen Occupy Minnesota protesters were arrested at a downtown demonstration, the group quickly took to the Internet, posting video that activists said showed police treating them roughly and never warning them to leave. But Minneapolis police knew warnings had been given. And they had their own video to prove it. So they posted the footage on YouTube, an example of how law enforcement agencies nationwide are embracing online video to cast doubt on false claims and offer their own perspective to the public. "It certainly frustrates the street officers to see their work being twisted into something that didn't happen or things being taken out of context," said Minneapolis police Sgt. Bill Palmer. "Frankly, the use of force, which is what most people want to film, is never going to look good, and the context can easily be twisted." After years of seeing officers' misconduct captured on video, police departments across the nation are trying to use the medium to their advantage, releasing footage of their own to rebut allegations and to build trust within communities. One department even posted video of an officer punching a woman to show why he was fired. "We want to be transparent," Assistant Chief Janee Harteau said. "Here is what we did. You can see for yourself and be your own judge." Larger departments in cities such as Boston, Baltimore and Milwaukee have had YouTube channels for years. They often post surveillance video, updates on cases, messages from the chief and public-service announcements. Some agencies don't rely on YouTube. After Oakland, Calif., officers were criticized for the way they handled an Occupy protest in October, police there released four videos on their website showing hostile protesters surrounding police and throwing paint at them. Officers later resorted to tear gas. Jeff Bumgarner, a professor in the law enforcement program at Minnesota State University-Mankato, said when police release video, it gives them added credibility. "It does take a lot of the wind out of the sails of critics who assert a lack of transparency," he said. The Milwaukee Police Department posts full news conferences and has started using its YouTube channel to record interviews with traditional media outlets — especially when police believe the reporter is being combative or pursuing an agenda. Investigators have also solved crimes with YouTube. Milwaukee officers recently arrested one of the city's most wanted suspects after a citizen saw a television news clip and then went to YouTube to watch the full surveillance video. Just last month, the department posted video of an officer punching a woman in the face while she was handcuffed in his squad car. Spokeswoman Anne Schwartz said the department wanted to share what had happened, while reiterating that the officer was fired for his conduct. In Boston, the police department was lucky to have an officer interested in social media and another with a broadcasting background, said former police spokeswoman Elaine Driscoll, who left the department shortly after talking with The Associated Press for this story. Milwaukee police have their own audio-visual specialist who attends news conferences, and Schwartz said her office acts almost like a small news operation. The Minneapolis Police Department, which has a smaller staff, is just getting started. For now, the department's two media spokesmen are learning to shoot video. Some planned events might be assigned to a crime lab videographer, or supervisors could capture footage on their cellphones, Harteau said. The city has no plans to put cameras in the hands of all officers. After its first two months, the Minneapolis YouTube channel had more than 6,000 views of its 13 clips. The most popular video is raw footage of authorities rescuing a despondent man from a highway overpass. There are also clips from the Occupy arrests and from a news conference in which the mayor announced Harteau as his choice to be the next chief. 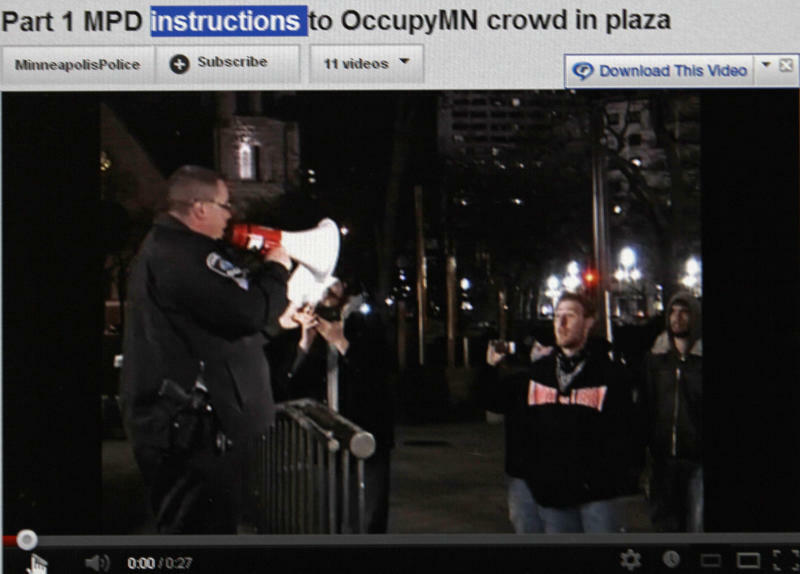 Sam Richards, an Occupy Minnesota organizer, said the police video of the April 7 arrests was "like a joke." He pointed out that protesters' claims go beyond whether they were ordered to disperse. And he noted that one officer was accused of knocking a TV crew member's camera to the ground — which protesters caught on video. "I don't think it's for transparency," Richards said. "I think it's for them to save face and maybe even intimidate us." A complaint was filed in the case of the videojournalist, police said, but protesters have made no formal complaints. Minneapolis police Lt. Mike Sauro said citizen videos often show only the end of a confrontation, when force is being used, not the circumstances that led up to it. "Anybody who hangs around with the cops for a while" sees the difficulties they face, said Sauro, who was fired in the 1990s after allegations he used excessive force and eventually got reinstated. The YouTube channel is a good idea, he said, but the department shouldn't turn itself into a propaganda machine. "The public pays our salary, and they should know exactly what's going on, whether good, bad or indifferent," he added. 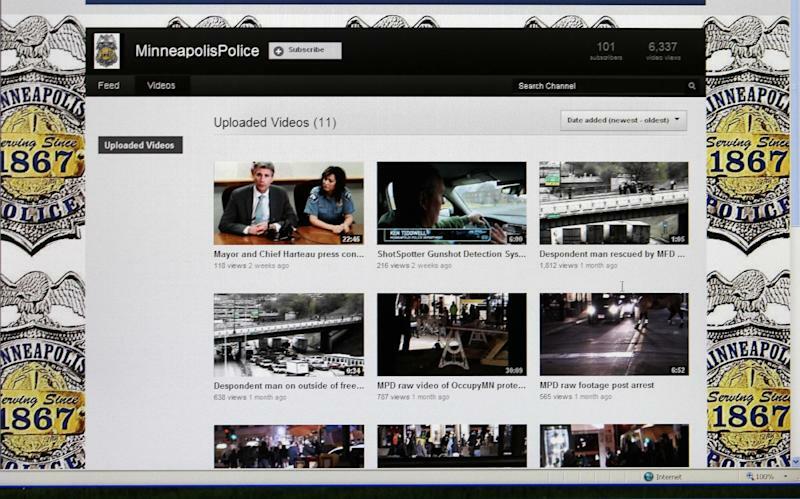 In neighboring St. Paul, police have not posted any videos on YouTube, but senior police Commander Joe Neuberger said video can aid investigations. For example, recordings made when the city hosted the 2008 Republican National Convention helped bring additional charges against violent protesters. And when protesters sought to use video they had collected in a civil case against police, officers countered with their own footage. A judge then refused to allow the protesters' video into evidence. Harteau acknowledges video's limitations. For one thing, the camera only sees what it is pointed at. In addition, some footage can't be posted because of investigative or privacy concerns. Palmer, who has experience as a street officer, said video once cleared him when someone complained he had used derogatory language and acted rudely during a traffic stop. Footage taken from the squad car showed that wasn't the case. "You have to step up and take responsibility for those things that are mistakes," Palmer said. "But you also have to use it as a tool to show your side of the story and promote values of the city and the police department."